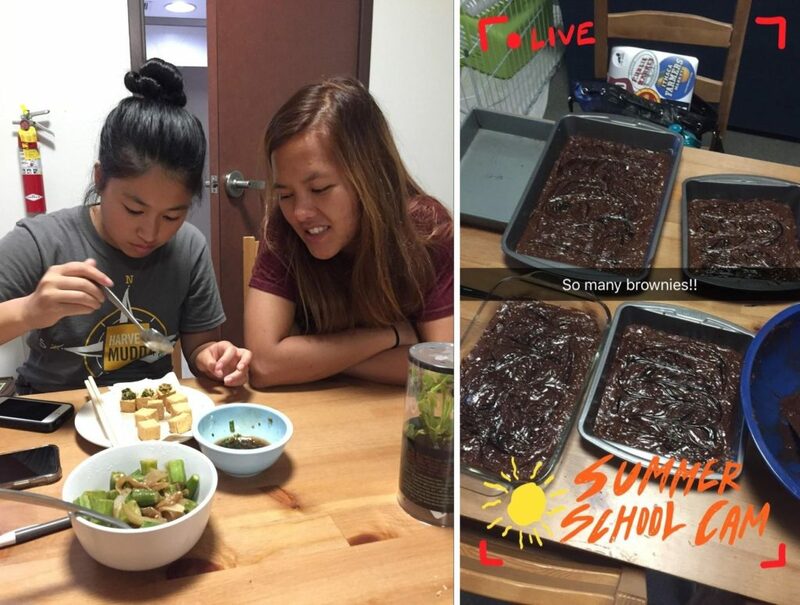 Food, Friends, and Foliage: My Summer in Admissions! Greetings everyone, it’s Hannah again! 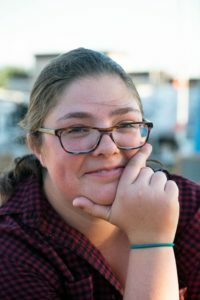 I know nothing I write this week can be as heartfelt and awesome as Kailee’s blog from last week* — if you haven’t read it yet, go read it now! But as the summer starts to come to a close and incoming students arrive on campus for orientation, I’ve been thinking a lot about all the fun things I got to do this summer. 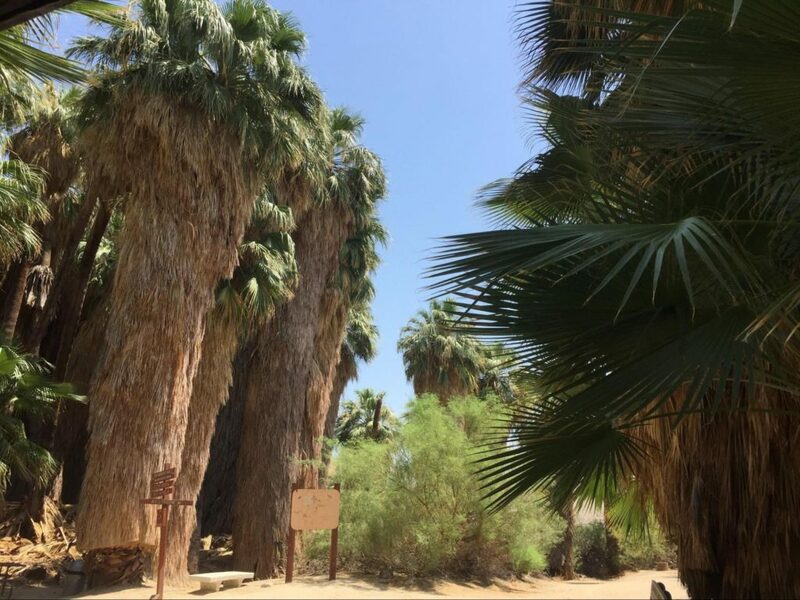 I love living and exploring in the Claremont area and wanted to share some of the highlights with you! *editor’s note: this blog post is pretty awesome. Read on! At the beginning of the summer, I spent most of my weekends (and any other spare time) reading, which is something I don’t always have lots of time to do during the school year. I got to read books ranging from a few Harry Potter books, some cool biology books, and everything in between! I also explored some new cool areas close to Mudd. One of my new favorite views in Claremont is from the top of the parking garage in The Village, where you can see everything from the town to the mountains! My friends and I drove up Mount Baldy (a 10-minute drive from campus) in the middle of the night and got to look up at the stars and down at the city lights. It was really beautiful and quiet. 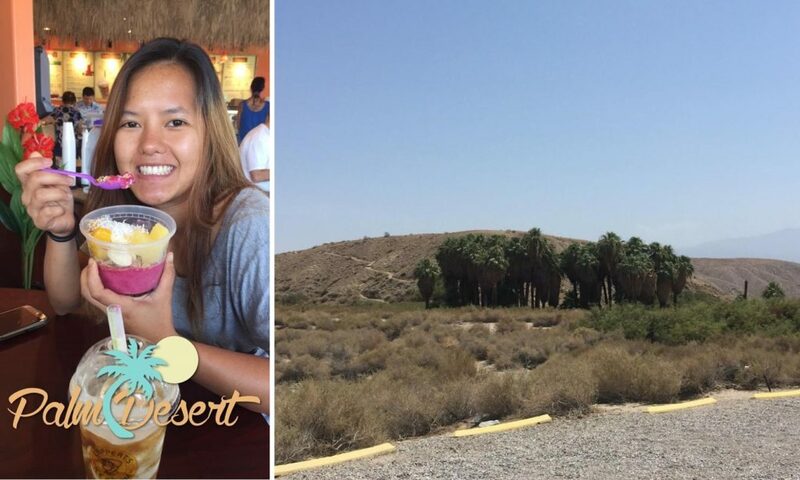 My roommate Aom and I also took a drive east, tried a date shake, and found ourselves at a palm tree oasis! It was really pretty but also a bit too hot to walk around and explore for very long. I know I already wrote a blog about plants, so I’ll try not to spend too much time talking about plants again, but they really are super awesome! 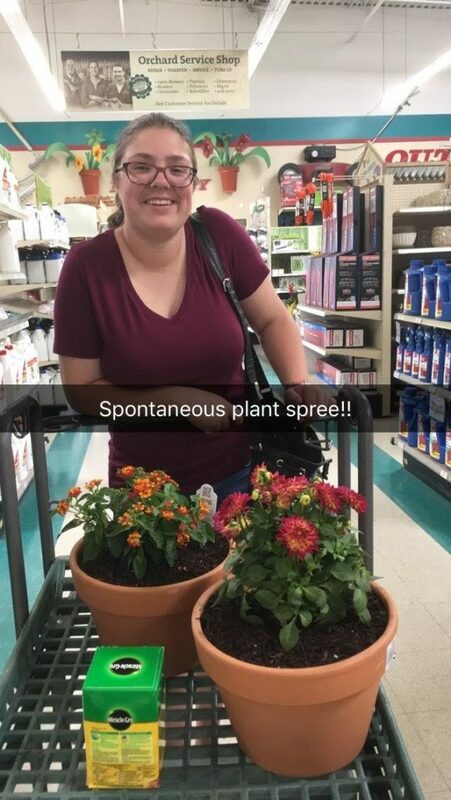 This summer I discovered Orchard Supply Hardware, and Kailee and I made friends with Parris, Adam, and Joey, the lovely garden section experts! Left: My first flowers (featured alive above) were accidentally burned beyond saving in the 115℉ weather. Middle: I recently purchased two more lovely indoor plants. Right: Kailee encourages me to buy more plants, but my roommate Aom worries about how much space there will be for her in the room. There are also lots of awesome plants at the Farmer’s Market! 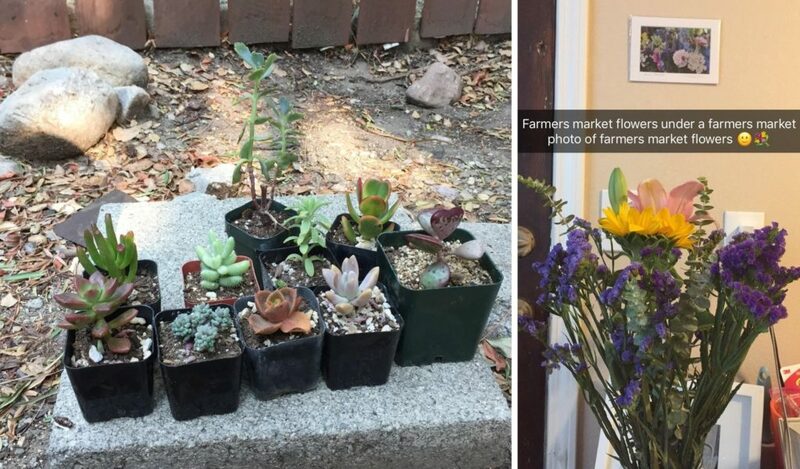 That’s where I recently purchased 8 succulents and a lovely bouquet of fresh flowers! Aside from plants, the Farmer’s Market has lots of great food and I got to try fresh fruits and some things that I had never had before, like okra! 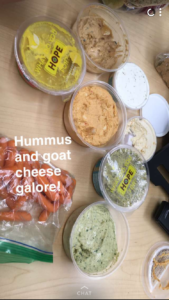 There’s some stands that sell goat cheese or hummus and pita chips (pro tip: those all make great quick lunch foods or snacks while doing homework!). Kailee and I got to cook a lot of food together too! I’ve made tons of new dishes, including lentils with market vegetables, stir fried okra and onion, glazed carrots, brussels sprouts with hazelnuts, fried tofu, salmon and broccoli, and lots of brownies and blondies! Middle: I learned how to make okra onion stir fry this summer and tried okra for the first time! Kailee and I have had lots of food with all the other admissions office interns too! The Financial Aid Office has a great drawer filled with awesome foods for pre and post-tour snacks! We have also gone out to breakfast at Wahfles a few times! Good food and great people is the best combination and everyone at the admissions office this summer has been amazing! Left: Some of the admissions office interns get their favorite snacks from the snack drawer after the afternoon tours and interviews! It’s been great to get to know even more cool Mudders, try new things, and explore Claremont when I don’t have quite as much homework. If you ever find yourself with a bit of extra time, I encourage you to try something outside of your comfort zone or hang out with new people! Posted in: General Blog, Students.